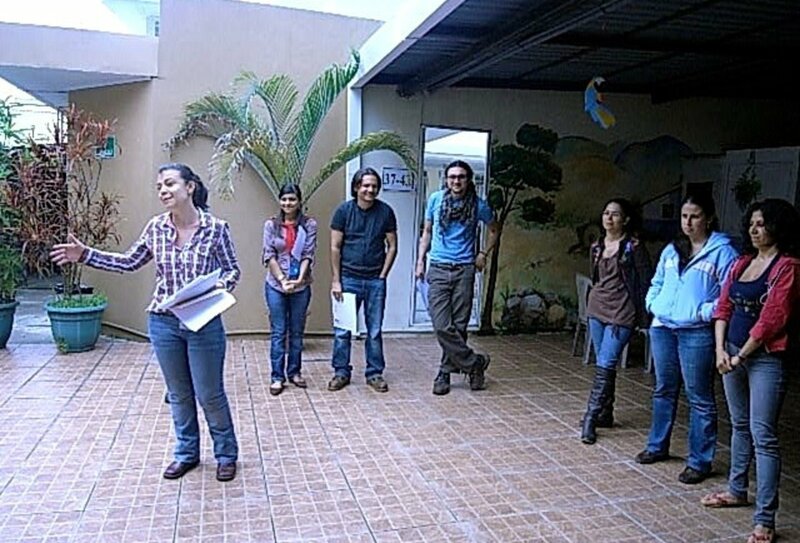 Learn to speak Spanish in a language school in San José, Costa Rica and join beginner, intermediate or advanced level classes to suit you. Discover Costa Rica, one of Central America’s most safe and stunning destinations, and live with a Spanish family on a cultural homestay experience. Stay with a local Costa Rican family, immerse yourself in Costa Rican culture and improve your conversational Spanish skills! Beautiful surroundings to learn in! 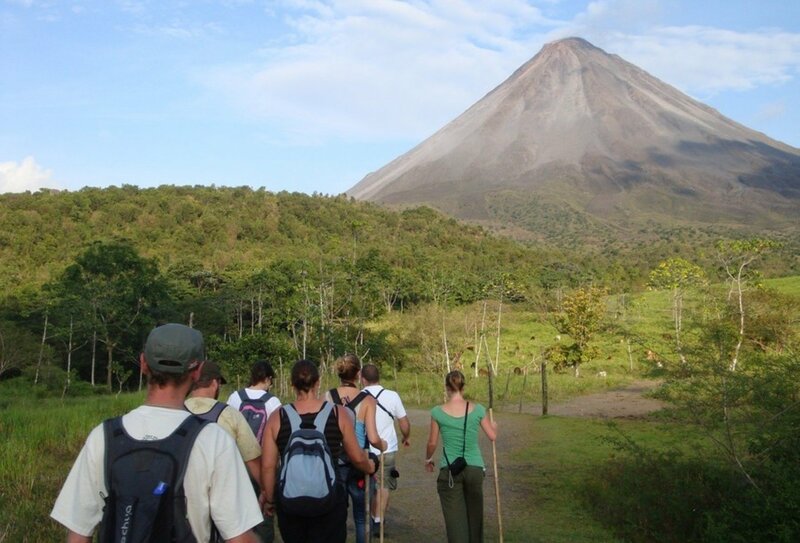 This Costa Rican programme offers a brilliant opportunity to take Spanish language lessons in the heart of Spanish-speaking Central America, enjoy a cultural experience with all-inclusive cultural activities such as dancing and cookery classes, stay with a Costa Rican family at a homestay and explore one of Central America’s most sensational, scenic, compact and safe countries – what more could you ask for? 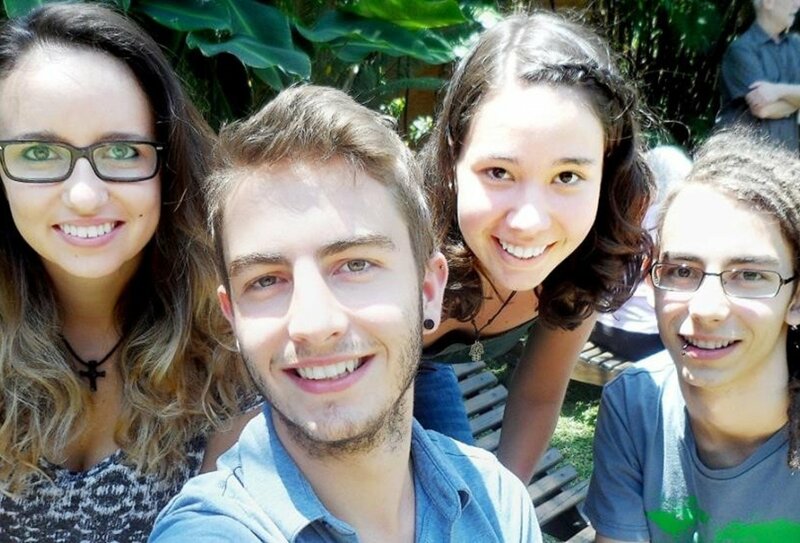 On arriving into San José you’ll be invited to attend a welcome meeting, where you will receive information on your upcoming placement and get to know a bit about the local area. Receiving a school ID card, a list of important contact telephone numbers, and practical information about living and travelling in Costa Rica, this meeting will cover a wide range of topics from safety tips, rules and etiquette for living with your host family, information about your Spanish course, a briefing on the school facilities and some information on the afternoon cultural activities which are held at the school. You will also be given maps of the area, bus timetables, bank and money information, and tourist information. This is your chance to answer any burning questions, and can find all the answers you need in a question and answer session at the end. On your first day of class you should plan to arrive at the language school by 8am (unless told otherwise). As other students will be starting at the same time, the school will want to assess your language level and place you all in the relevant ability band class to suit your needs. For this you will be asked to participate in an oral language test and complete a written exercise. The staff will then be able to decide if you are ready for the beginner, intermediate, or advanced classes, and your first lesson should begin at 9am! On the first teaching day your host family will accompany you to the school, and collect you after class. Classes run Monday to Thursday, every morning from 9:00 a.m. until 12:00 noon. Then there is a lunch break from 12:00 - 1:00 p.m. Afternoon classes run between 1:00-2:00p.m. After the first day, you will make your own way to and from the school from your homestay location. Public buses are very easy to use and cheap, and they run every 10-15 minutes from 5:30 a.m. until 11:00 p.m. Taxis are also very cheap and recommended if you are travelling at night. 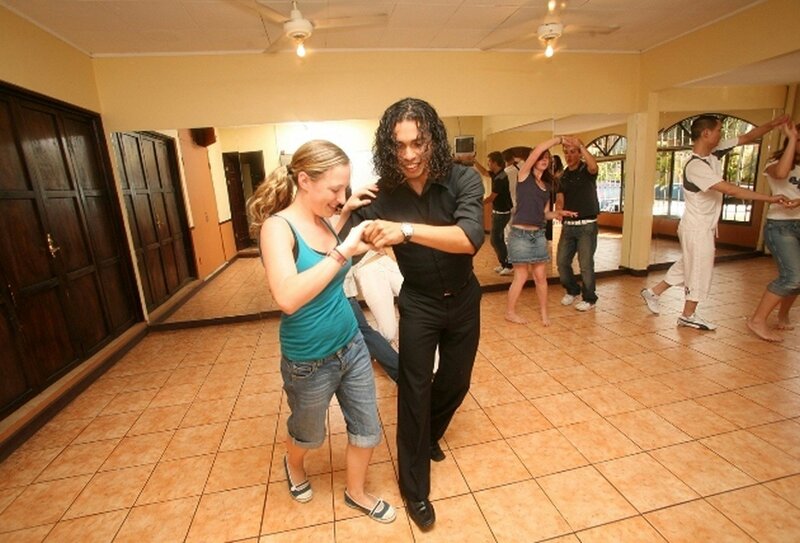 Latin dance classes are held every day from 3:00 - 4:00 p.m. and 4:00 - 5:00 p.m. Cooking classes are held on Wednesdays from 3:00 - 4:00 p.m. 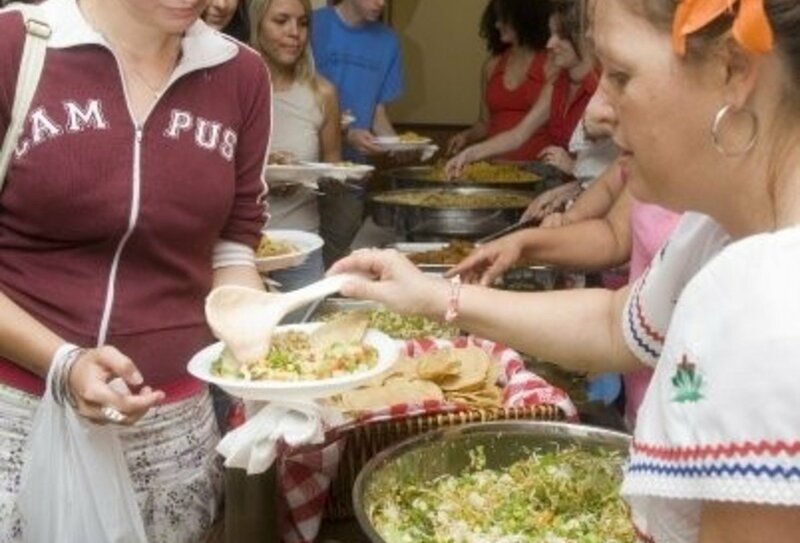 Conversation classes run on Tuesdays and Thursdays from 4:00 - 5:00 p.m.
All these cultural classes are conducted in Spanish, so you can improve your conversation skills and fluency. 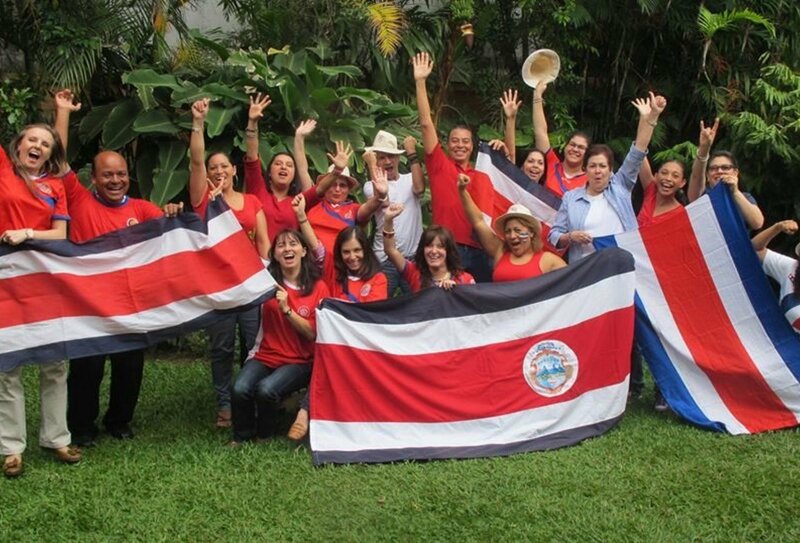 During your Spanish learning experience, you will be staying with a local Costa Rican family in their home, immersing yourself in Costa Rican culture and improving your conversational Spanish at the same time. Staying close to the language school, you’ll be warmly welcomed into the life of a local family, and you’ll soon find it becomes a Spanish-speaking home from home! There are plenty of museums, markets, clubs, restaurants, bars and theatres close by, so you can make the most of city life and have fun in your spare time. Some optional activities include visits to dance clubs with your dance instructors, and weekend excursions to beaches, rainforests, volcanoes and National Parks. 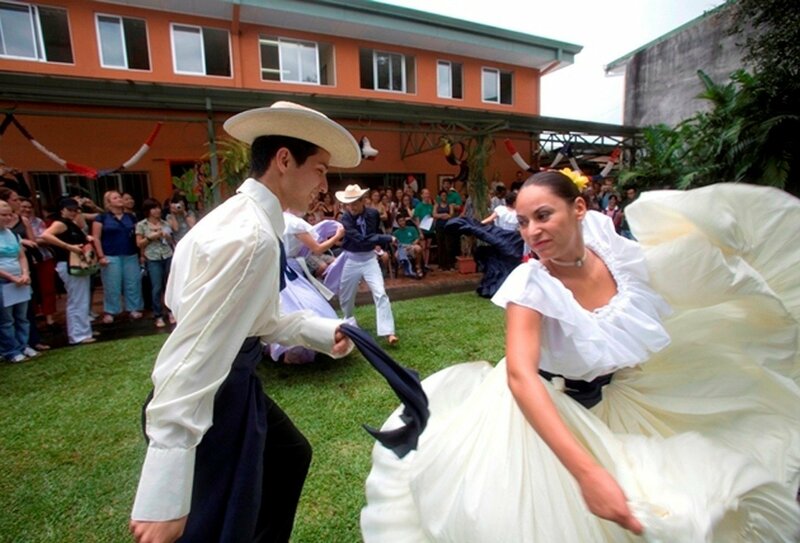 There are several cultural activities laid on at the school throughout the year, such as folk dancing, museum visits, football matches, craft fairs and the annual Independence Day celebrations, all designed to make the most of your cultural experience in Costa Rica. The language school is closed over Easter, Christmas & New Year. Though the school is closed, airport transfers & homestay services are available. The language school is located in San José, the capital of Costa Rica, and you will be met upon arrival at Juan Santamaria International Airport (SJO). From the airport we’ll take you to your local home-stay accommodation and introduce you to your host family. There’s no need to contact your host family before you arrive as we will already have informed them of your arrival time, and they’ll be waiting for you with the warmest of Costa Rican welcomes! If you are not travelling off round Costa Rica after your trip ends with us, you should schedule your return flights to depart on a Saturday or Sunday as all lessons finish on the Friday. 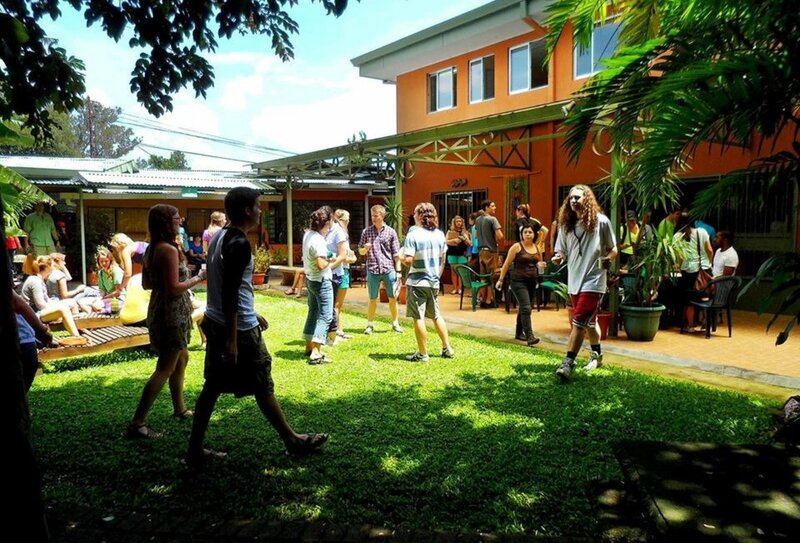 To make the most of your Spanish skills and to help you get to grips with the language that little bit quicker, you’ll be experiencing a true taste of real Costa Rican culture living in one of our home-stay placements. Staying with a local host family you’ll be welcomed with open arms and be immersed in San José life in no time! As a new part of the family, you’ll be kept safe and enjoy clean accommodation in your own room, unless you’ve specifically chosen to share with another language student or are travelling with a friend. Free to come and go as you wish you’ll be provided with a door key, but please don’t abuse this privilege, and be sure to let your host family know where and when you’ll be out so they won’t worry unnecessarily about you. Breakfasts, dinners and a laundry service will be provided by your host family, and they’ll be happy to cater for any special dietary requirements as long as you let us know from the start when you book your place. 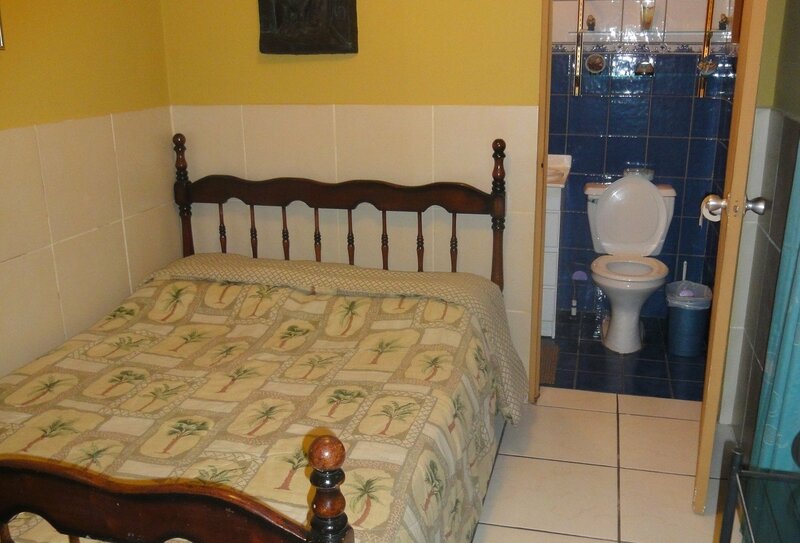 A weekly change of bed linen will also be provided, though you’ll need to bring your own towels. All of our host families live in nice residential neighbourhoods, and are only a 10-20 minute bus ride from the Spanish school. You can let us know on your application what type of family you would like and any preferences you may have (pets, diet, smoking, etc.) and we will make every effort to place you with the best family to suit your needs. 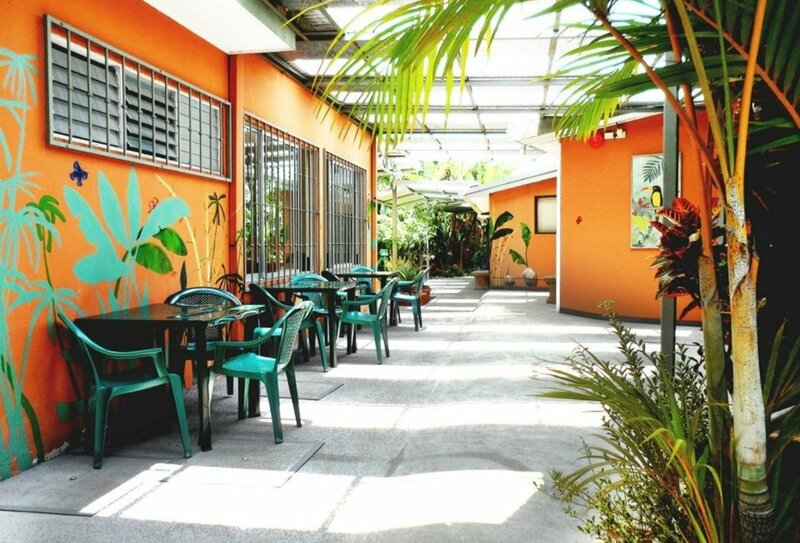 Though your accommodation may be a little more basic than a hostel or hotel stay, it will still be safe, secure and comfortable and the perfect place to experience real Costa Rican life and language in a loving and hospitable environment. During your stay you should bear in mind that the majority of our host families do not speak English. As they are used to accommodating students who don't speak Spanish however, they are always very patient and have become incredibly imaginative, communicating using basic words and sign language. 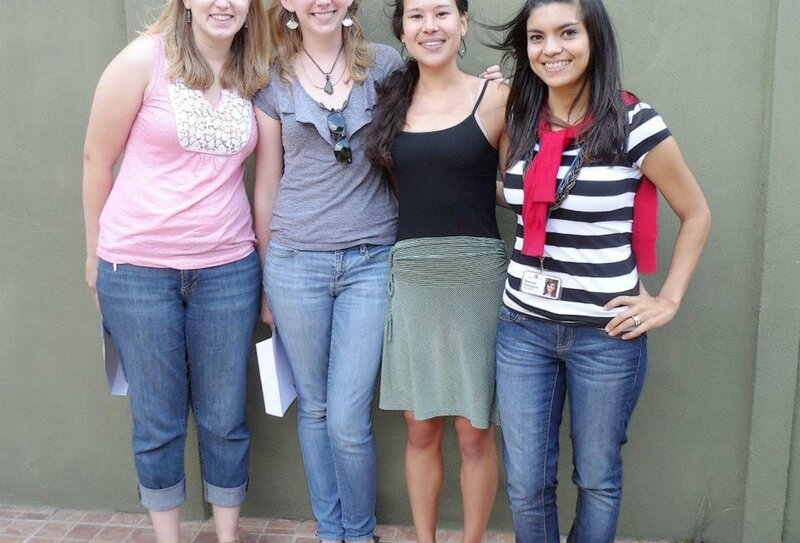 One of the advantages of the homestay is the opportunity to practice your spoken Spanish and learn conversational Spanish from your host family. If there is a serious need, the staff at the school all speak English and can serve as translators where necessary. The minimum age to participate on this programme is 18 years. 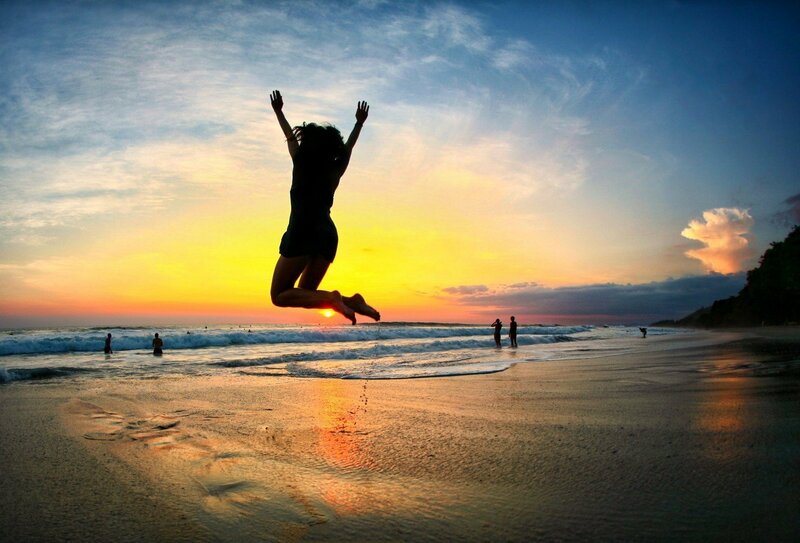 British nationals will not require a visa in order to enter Costa Rica, and can remain in the country as a visitor for up to three months. Before departing for your trip, you should make sure that your passport will remain valid for six months or more after your entry date. If you are travelling in to Costa Rica from a country at risk of Yellow Fever you must ensure that you obtain the required Yellow Fever vaccinations and bring a Yellow Fever certificate with you when you enter Costa Rica. Certificates of immunisation are valid 10 days after the original date of vaccination, and you should consult your GP for more information.